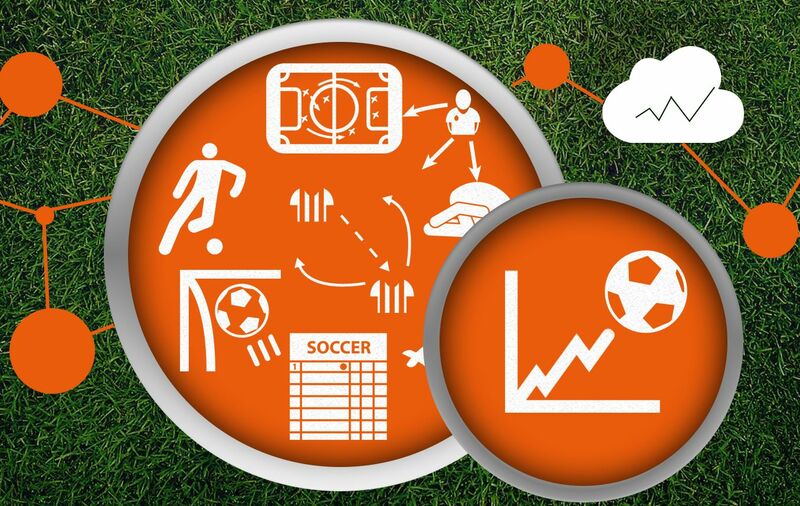 How Is Big Data Changing the World of Soccer? Sports clubs, media outlets and fans around the world all share a thirst for advanced statistics and information. Big clubs use them to improve the performance of their own players, prepare tactics against other teams, or scout potentially interesting players. Media outlets, on the other hand, love data as well since it gives added value to their reports. Finally, the stats have also outsized importance for fantasy sports managers who create their fantasy teams with individual athletes in top form. Let's start with last year's soccer World Cup in Brazil. While their last FIFA World Cup success can be attributed to many things, the Germans, known for technological know-how, had a trump card in their hands. Many soccer fans raised their eyebrows when it was revealed that the national squad wore Adidas' miCoach elite team system during training sessions before and during the competition. The physiological monitoring service collects and transmits information directly from the athlete’s bodies, including heart rate, distance, speed, acceleration and power, and then display those metrics live on an iPad. All this information is made available live on an iPad to coaches and trainers on the sideline during training, as well as post-session for in-depth analysis. Interestingly enough, analysis of the data can help identify the fit players from those who could use a rest. MiCoach is of course not the only device of this kind on the market. The major player is actually Australian company Catapult Sports, focused on GNSS (global navigation satellite system) data, which is increasingly important to sports scientists and coaches, who monitor it to measure player movement and fatigue. As you probably have guessed, the tracking devices rely on GNSS satellites. However, they also have their own local positioning system, ClearSky, which can be installed around the indoor area of the stadium when obstacles, like a closed roof, interfere with the ability to lock on to individual units. ClearSky uses anchor nodes to track players’ movements, while the devices with transmitters are worn at the top of the back, held in place by a compression shirt that looks a bit like a sports bra and can be worn over or under the uniform. Another pioneer of wearable tracking devices is GPSport, acquired by Catapult Sports in July, known for its sophisticated performance monitoring devices that incorporate advanced GPS tracking with heart rate. The combined group now works with more than 450 teams worldwide, including Chelsea, Real Madrid and Brazilian national team. All these tracking devices fall under the Electronic Performance and Tracking System (EPTS) category. Until July, soccer players were allowed to wear them only during training, but this has now changed. On July 7, the international governing body of soccer FIFA issued a memorandum announcing the approval of wearable electronic performance and tracking systems in matches – on the condition that they do not endanger player safety and that information is not available to coaches during matches. It's worth noting that every respective association, league or competition has the final decision on whether to adopt or reject EPTS devices. FIFA has already made a step forward to control the use of these tools for its own competitions. After suffering several concussions, U.S. soccer veteran Ali Krieger had chosen to wear performance protection headgear from FIFA-approved Unequal Technologies during this month's women's soccer tournament in Canada. Unequal Halo, which looks similar to Petr Cech's famous black protective helmet, combines Kevlar, high-tensile strain fibres, and an Accelleron composite for ballistic-strength protection against concussions. So when force hits the 10-millimetres-thick Halo, instead of pinpointing directly into the head at the point of impact, it disperses the energy throughout the entirety of the headband. Going back to soccer data, FIFA relies on a visual tracking technology called Matrics to provide extensive data set in real time that makes up the on-site heat maps, passes completed and distance covered. The company behind Matrics is an Italian firm called Deltatre that uses several technologies and manual inputs from a large crew to deliver the real-time stats. This technology has been around for years, but it's becoming more diverse, detailed and accurate. Deltatre has also been appointed by UEFA to provide a number of services from each Champions League venue. These include on-air graphics generation, which is directly embedded into the multilateral feed, and data capture for UEFA’s official results system, produced using a combination of a player tracking system and dedicated in-venue spotters. On UEFA's website one can find a comprehensive list of stats for players, clubs, groups, matches and goal times. FIFA also collaborates with Infostrada, which delivers live match coverage (streaming) services, and develops and calculates a World Ranking for the women’s national teams associated with FIFA’s competitions. Apart from Deltratre and Infostrada, sports data markets have other big players. One of them is ChyronHego, mostly known for its player tracking technology TRACAB, which uses advanced patented image processing technology to identify the position and speed of all moving objects within each soccer arena. At 25 times per second, the system generates live, very accurate X, Y, and Z coordinates for every viewable object, including players, referees, and even the ball. The data provides insight for coaches to evaluate player performance and track metrics such as distance run, speeds, stamina, pass completion, team formations, etc. TRACAB is installed in over 125 stadiums and is used in more than 2,000 matches per year by the Premier League, Bundesliga, and Spanish La Liga. ChyronHego has an agreement with Bundesliga, while Premier League's first sports technology partner is EA Sports. The official data provider for the French Ligue 1 is Prozone (acquired by U.S.-based competitor Stats LLC in May 2015), which has a product that works in a similar way to TRACAB. Using around 10 cameras, the programme creates a two-dimensional animation of the playing field and is capable of registering 3,000 touches of the ball per game. It offers real-time, post-match and opposition analysis, and now most of Premier League teams use the system. Many soccer leagues and clubs also collaborate with Opta, the leading provider of soccer sports data. Opta’s analytics can determine every single action of a player in a specific zone on the field, regardless of whether he has a ball or not. It can also measure the distance the player runs during the course of a game. There are more that 100 match-specific statistic categories, for instance shots, goals, assists, yellow and red cards, won and lost duels, and also some less known categories such as accurate corners into box, effective blocked cross or accurate keeper throws. This type of analytics is useful for clubs when scouting and to help shape roster development decisions. Probably, the most known supporter of this approach among the top managers is Arsene Wenger. The Arsenal manager once said that the personal touch in player scouting remains decisive, but the computer-generated statistics can certainly help his management to find a player they need. Not surprisingly, back in 2012, the English club even bought US-based data company StatDNA that provides expert analysis, guiding everything from identifying new players to post-game tactical analysis. Moreover, the stats are also used by betting companies (William Hill embed Opta's regular contextual facts directly within its betting platform, while SkyBet uses them to add detail and colour to its regular email marketing communications), and more recently Daily Fantasy Sports (DFS) operators. Sports data is used in two ways: firstly, companies use it to form scoring systems, and secondly, it's a must for fantasy players who have to study many pieces of information in order to be successful fantasy sports managers. The more information they have, given the ability to dissect it, the higher are the chances to enhance the competitiveness. Fantasy football (soccer) operators usually form partnerships with sports data companies, and use a limited number of stats, normally from 5 to 20, to sum up a game. However, there is one company whose scoring system is by far the most advanced one can find. The Malta-based company Oulala Games Ltd has built a mathematical matrix that uses Opta's data to create an efficient scoring system. This company's platform uses a highly sophisticated algorithm to assess the crucial aspects of an athlete's performance that contribute to an overall result. Their system includes a total of 70 different criteria dependent on a player's position (keeper, defender, midfielder, and striker) resulting in a total of 275 ways to gain or lose points. The aggregated numbers of these actions, made by players who are included in virtual teams, give the overall winners of different daily leagues. Despite the fact that a high level of skill is required to become a league's winner, some professional DFS players, especially in the U.S., have found a bypass that gives them a substantial edge over their competition: They are using advanced software known as scripting, which helps them to decide which players to pick, and in many cases, automatically enter hundreds of line-ups in multi-entry guaranteed prize pool (GPP) contests. Currently, all major DFS operators allow the practice. Soccer, which has always been a numbers game, is apparently driven by more and more Big Data. Clubs are now probably hiring fewer scouts and more computer analysts; TV, radio and newspapers drive more stats-based conversation about the performance of players, managers and teams than ever before. Numbers are also seeping out of real soccer and into the fantasy – the stats that surround players are not only used to measure their actual performance, but also to evaluate their contribution to fantasy soccer teams. It's fair to say that this Big Data revolution in soccer will only continue and change the whole experience of watching the most popular sport in the world. Jure Rejec is the writer for Oulala.com, one of Europe's leading fantasy football/soccer sites. He is passionate about Fantasy Sports Betting/Wagering, its technological innovations and Big Data.